So I was talking with a friend about hypothetical cross-franchise class matchups, in the vein of Scout vs Tracer, Medic vs Sona, Engineer vs Nuparu, Heavy vs Braum, and Pyro vs Toa Vakama. It’s a pretty popular concept on our blog and I realized we hadn’t covered one of the most obvious, that of TF2’s favorite Kiwi versus Overwatch‘s favorite cheesecake. 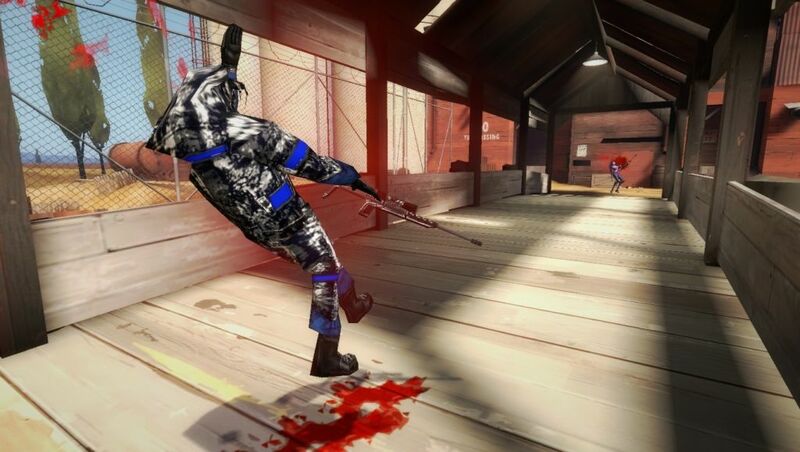 But after ruminating on the idea, I had trouble even starting due to the nature of TF2 Sniper’s unlocks. Do I treat TF2 Sniper as his stock class (which means Widow wins easily) or as an amalgamation of his unlocks, which turns him into a horrifying combination of the Machina–Huntsman–Jarate–Darwin’s Danger Shield and nothing that even resembles Widow’s more typical build. The question got a lot more interesting when jumping backwards and comparing Widow to Mundy’s more deadly predecessor, the eagle-eyed Team Fortress Classic sniper, whose real name is Virgil according to TF2 Comic#6. So without further ado: Whose kit is more powerful? And who would win in a (very, very short) fight? At the heart of the comparison come their two kits. Both characters wield sniper rifle primaries (more on those later) that have an alternate ‘assault-rifle’ firing mode. Virgil’s automatic rifle is far superior, however, maintaining perfect accuracy and not requiring reload, letting him hold his own against close-range threats to a degree Widowmaker really can’t. The biggest drawback to the automatic rifle is that it quickly chews through Virgil’s reserve pool–a problem Widowmaker completely ignores due to her universe possessing the miracle of infinite ammunition. Also important to mention, Virgil’s sniper rifle slows enemies on bodyshot, a feature Widow’s rifle lacks in any way. Virgil also has Widow beat on the supplementary weapons in their loadouts. Not only is he carrying four hand grenades that can kill any class in TFC twice over, he’s also got a nailgun that, while outshined in every way by his rifle, has its own ammo pool keeping him from being defenseless when his rifle runs dry. Widow’s only backup weapon is a weak poison mine mostly useful for covering her exit to let her know when somebody’s flanking her. But her mobility far exceeds Vergil’s because she has a Grappling hook that gives her access to the most remote crannies of the map. Virgil’s two mobility tools either cripple him (grenade jumping) or only works on teammates (dealing knockback by shooting them with the sniper rifle). In a close-range fight, Vergil would absolutely have the upper hand, while Widow’s primary goal would be to escape with her grappling hook. If Widow can prolong the fight long enough to passively charge her ultimate, her Infra-Sight visor would let her see through walls and give her a powerful edge for 15.5 seconds. 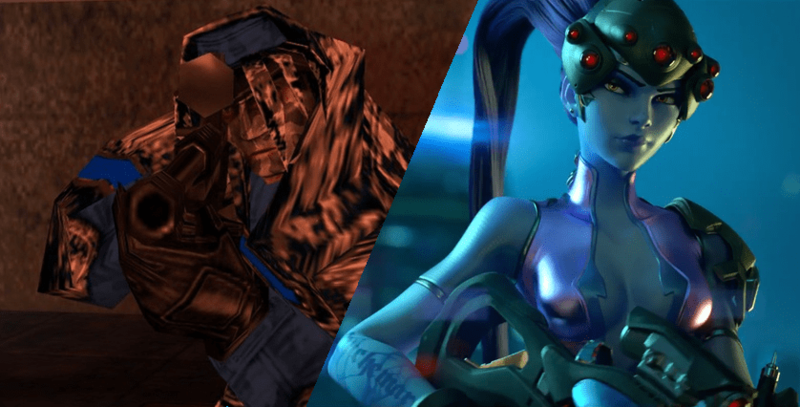 In-game, the two characters lack much of a personality, but both franchises have comics that show us a little more about how each character behaves, and I’d say Widow has the advantage if their combat tendencies are taken into account. As the Legacy comic shows, she takes the shot when she gets it, even against a former friend she’s known for years. If The Naked and the Dead is anything to go off of, TFC Sniper would monologue at her and offer her a cigarette right before getting his head blown off. Though to be fair, we only see him when he has the clear advantage against opponents not really in a position to fight back. I suspect that during an actual 1v1 against a legendary sniper, he would stay very focused and take the shot as soon as possible. Speaking of which, as fun as it is to compare their kits, none of that would matter in a 1v1 because an actual duel between the two would almost certainly boil down to a single bullet; whoever’s gun charged fast enough to deal lethal damage would fire and land the killing blow on their very first try. So to answer the question of “Who would win?” I have to find a way to compare their health pools and the damage on their primary firearms. Luckily, their health basically doesn’t have to change; Widowmaker has 200hp and Virgil has 140, the bog-standard values for squishies in their respective games, though Virgil also comes with 50 Armor which absorbs 30% of the damage from any attack, meaning her shot must deal 195 to kill (as the armor would absorb 15 damage before running out). The TFC Sniper rifle deals 100 damage on an uncharged headshot and charges by +100% every second, meaning it would take him only 1 second to charge and fire a killing blow with his rifle. Widow’s rifle, in comparison, deals 30 (12 base damage times 2.5 headshot modifier) on an uncharged headshot, and charge increases base damage by its own value. It also takes 1.5 seconds for her gun to reach 100% charge. So, after 1 second she’d deal 66 bonus damage (Widow’s the only class in the game that deals 2.5x damage on headshots), for (12+66)x 2.5 equals… 195. Well damn, looks like they both get a killshot at exactly one second. Could it really end any other way? Previous Previous post: The Daily SPUF Thread Hits 10K Replies!